The larvae feed on chiefly on members of the custard apple family (Annonaceae) but have been found on species of Michelia (Magnoliaceae). Mature larvae 38 mm long, body in shades of green with a white line and several spines are present; head yellowish to olive. 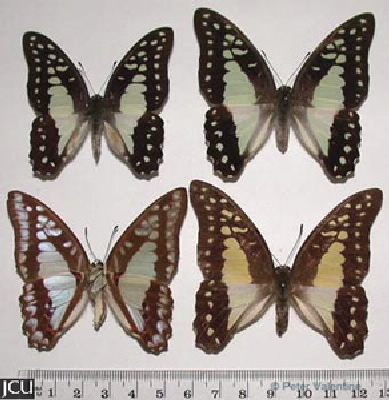 Adults are black with a pale, bluish-green to cream broad band and irregular markings; lower surface paler brown with similar markings.